We then headed a bit upriver, back towards Supai village. The Lower and Upper Navajo Falls are on this stretch of the river. The Lower falls are relatively shallow, and we saw a horse and her foal drinking from it when we got there. I have been through all my photos, and don’t seem to have taken a picture of them. 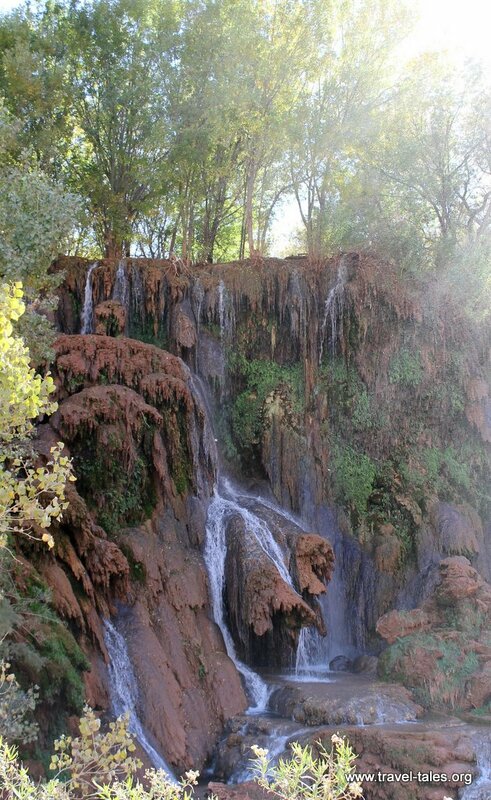 In one of the pictures above you can see the Upper Navajo Falls, which are not only further upriver but also taller. They are also an excellent example of rust coloured travertine, the limestone deposited by the river. It looks very fern-like and a bit like fossilised plants. In some waterfall locations moss grows on the travertine, which then is covered by more travertine deposit. You can see from the pictures that the water at the bottom of the falls was in the shade and it was rather chilly. Mandy braved a dip while the rest of us stood on a rock overlooking the falls in broad sunlight. She came back out and told us about the views behind the trickling falls and I decided to brave it too. The water was very cold, but once you are in it, it is more pleasant to stay in the water than climb back out!